Influencer marketing effort is often front-loaded. It takes time - and therefore money - to identify the most appropriate influencer for your brand. Spend time carefully identifying, selecting and briefing avatars. Vet CGI influencers through a careful and thorough process of digital due diligence. Fret that a CGI influencer will produce another Logan Paul Aokigahara forest moment and tarnish your brand by association. CGI influencers will always turn up on time for the creative shoot. They’ll always look Insta-immaculate, too. Investors see the growth potential in these computer-generated creations becoming mainstream fashion influencers. Proof of concept has been made de-risking their investment. Lil Miquela, for instance, has worked with Prada on its Autumn Winter collection. She’s posed wearing Diesel and Moncler, too. Lil Miquella may be the most famous she’s not the only Insta-creation working with fashion brands. Shudu, is the CGI 'supermodel created by British photographer Cameron-James Wilson. Shudu was designed as an art piece celebration of beautiful dark-skinned women; a project to frame beauty. The Shudu Instagram account went viral when Fenty Beauty - the make-up brand owned by singer/songwriter Rihanna – posted Shudu’s image wearing one of its lipsticks. Since then, Wilson says, he’s received many brand offers in the fashion and tech worlds, all hoping to work with the CGI model. The fashion vertical is, perhaps, the natural space to inhabit for these CGI influencers. Always looking Insta-immaculate there’s no need for these CGI models to succumb to perpetual dieting, gruelling beauty regimes or cosmetic surgery. There is a long history within the fashion industry to touch up images so as to perfect them. From the antediluvian airbrush to 3-D graphics and Photoshop. These avatar influencers become dolls or mannequins that can be placed within any context and dressed in any sponsoring-fashion house’s garment. In the social age the professional and personal life blend into one. You can no longer fully separate the two. And so, a significant contradiction of Lil Miquela ranking as one of the Insta-famous with her 1.1 million followers is her ‘human story’. Lil Miquela portrays a more rounded self in her Instagram feed. She shares stories of British school boys helping avert a suicide attempt. She writes letters to the US Congress in support of the transgender community and builds awareness within her following of the 1.4m transgender group living in her country. The URL in the bio on her Instagram feed links to black girls code - a charity aiming to increase the number of women of colour in the digital space. Such elements are expertly curated to communicate the rounded self of what it means to be human. A set of values and ethics which overlay the commercial imperative of identifying brand sponsorship. Given this context Lil Miquela becomes more real than some human Instagram influencers. Final word: What does this mean for disclosure regulations? The Financial Times newspaper ran an interview with Lil Miquela a few weeks ago. Of the dozen or so questions the only one which went unanswered was: 'Do you put up sponsored (paid-for) content on line? The Federal Trade Commission is the independent agency of the US government tasked with promoting consumer protection and regulating influencer marketing. Last year, it updated its endorsement guides to require influencers to disclose their marketing relationships and identify paid posts with a hashtag like #ad or #sponsored. So far it's unclear how those rules would apply to CGI influencers who aren't human, and whose creators cloak themselves in secrecy. Presumably brands paying these avatar influencers would be the first to receive the FTC knock at their door. This claim by brud answers 1 question but poses another. If true it officially answers the obvious - that #Miquela is #CGI (well derrr!) 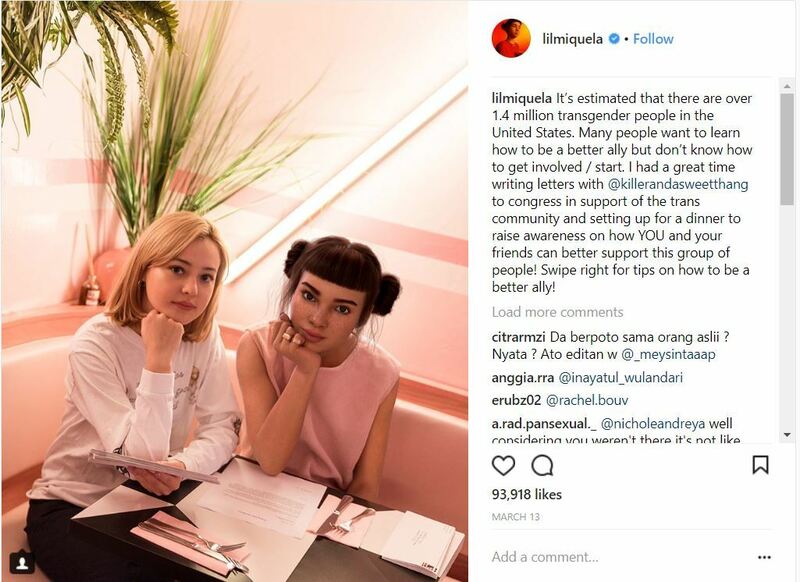 But who should the @FTC chase when @lilmiquela flouts #InfluencerMarketing disclosure regs? * When the Lil Miquela Instagram account was ‘hacked’ last month by fellow CGI Insta-influencer Bermuda I tracked two of the people behind Brud: Sara Decou, chief of Stuff at Brud and Trevor McFedries. They appeared to be operating from a residential address one street away from the Los Angeles City College. Previous Post #FuturePRoof 3: New book showcases PR best practice in NHS Next Post Klout closes. Who knew it was still on?